The AdirOffice Heavy-Duty, Secured Safe Drop Box is the perfect solution for receiving and temporarily storing a variety of items after hours or when you are away from your business. Measuring 15" H x 12" W x 4" D, it supplies a generous storage capacity for documents, payments, keys, remote-access devices and other small items. Constructed using rugged, 14-pound steel to provide long-term strength, this drop box is designed to stand up to daily use and last you for many years to come. It’s furnished with a powder-coated finish to supply a durable, attractive appearance, while providing increased protection from scratches and scuff marks. Serving a variety of needs, the AdirOffice will be a convenient addition for retail stores, rental facilities, customer service counters, manufacturing plants, auto shops and other facilities. The drop opening measures 2.3” H x 9.8'' W to accommodate a variety of materials dropped off after hours, while, the 5.8'' H x 9.8'' W collection door facilitates easy access inside for content removal. Keeping items secure, the drop box safe has construction and design features that discourage unauthorized intrusions. For starters, the steel storage bin door is double-thick and equipped with a replaceable, Double-D cam lock to prevent break-ins. Additionally, there are also two, tubular-type keys that are difficult to duplicate. To make it complete, this multi-purpose drop box is equipped with pre-drilled holes and includes all the necessary hardware and tools so you can quickly and easily install it on any wall or door right out of the box. It’s also available in white or black so you can seamlessly incorporate the drop box into any interior setting. CONVENIENT, AFTER-HOUR DROP BOX. 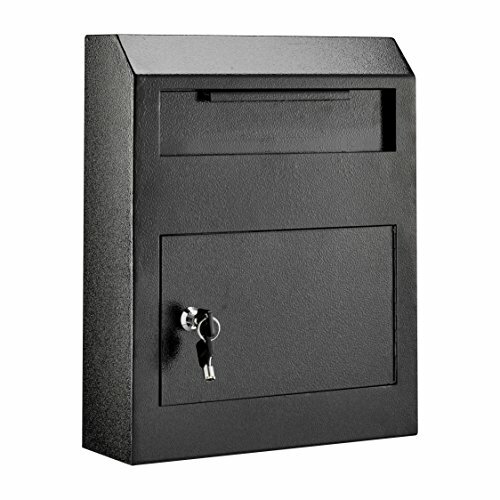 This wall-mounted safe provides the perfect solution for secure drop box applications in any business, furnishing ample room for keys, payments, remote-access devices, mail and other important materials that need to be dropped off after hours. BUILT TO LAST. Sturdily constructed using rugged, 14-pound steel with a double-thick storage bin door, this drop box will provide long-term strength and use for years to come. It also features a powder-coated, scratch-resistant finish for a durable, attractive appearance. SECURE DESIGN. Providing optimal security, the drop box is equipped with a replaceable, Double-D cam lock to prevent break-ins and tampering. It comes complete with two, tubular-type keys - which are difficult to duplicate - to facilitate easy content removal. SUFFICIENT SPACE. Measuring 15" H x 12" W x 4" D, this drop box supplies a generous storage capacity for multiple items. The drop opening on top allows materials to be dropped inside with ease, while the 5.8'' H x 9.8'' W collection door provides easy access when you need to empty them. HARDWARE INCLUDED. For added convenience, the drop box is available in two, easy-to-incorporate color options and comes complete with mounting screws, washers, anchors, a driver bit and drill bit so you can install it right out of the box. It's also equipped with pre-drilled holes for easy, secure mounting on any wall or door. If you have any questions about this product by AdirOffice, contact us by completing and submitting the form below. If you are looking for a specif part number, please include it with your message.